Machine Shop, Welding | Richmond, VA - High-Tech Machine Mfg., Inc.
For more than twenty years, High-Tech Machine Mfg., Inc. has been building a reputation for quality, service, and competitive pricing. Our 14,000 square foot facility features the latest equipment, all of which are all fully computer-controlled and automated. This allows us to provide you with the highest quality parts, machined to the tightest tolerances and exceeding your most rigorous specifications. Our modern CNC machines and techniques are fast, which gets you the parts you need on time. From large and complicated orders to short runs, we take pride in delivering on schedule. 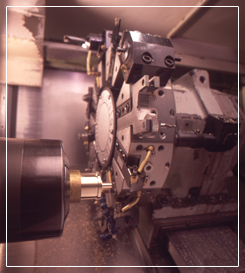 Contact us to learn about our machining services. Contract machine shops open every year across the country, but few ever take the chances on investing in truly high-tech machine tools. Our founder, Bob Cacciotti, took the riskier path when he started our company in 1984, by investing in the latest technology available in machine tools. Today, serving customers in Richmond, Virginia, and nationwide, High-Tech Machine Mfg., Inc. continues this philosophy to use the most modern equipment to create quality small to medium-sized precision machine parts, with both CNC production and CNC millwork and small assemblies. To build partnerships with customers to supply precision machine parts and assemblies with superior quality and on time delivery as contracted. To create a positive working environment for its employees and treat everyone that comes in contact with High-Tech Machine Mfg., Inc. with dignity and respect.